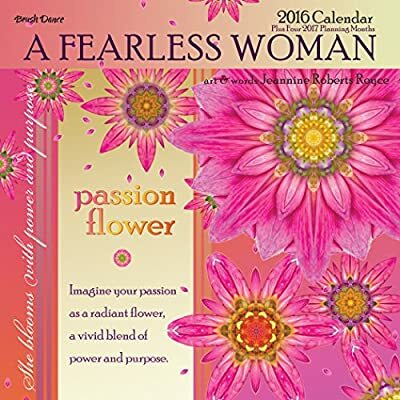 Through the cycle of the year, the radiant floral art and empowering words of Jeannine Roberts Royce inspire you to live your truth with passion, resilience, and resolve. Monthly Quotes:January: Believing big.February: Passion flower.March: Shining through.April: Letting go.May: We are fearless women.June: Today I begin.July: ItÍs never too late.August: Medicine for the soul.September: Golden opportunity.October: WhatÍs humming inside?November: Imagine your vision.December: Kinship. Details and Dimensions: 7"" x 7""Durable cover and punch holeQuotes on each pageFull color artPrinted on high-quality FSC-certified paper. The FSC Mix label ensures that the timber used to produce the paper is from a mixture of reclaimed timber or fiber, FSC-certified forests and/or controlled wood.